Africa’s digital journey is rapidly gaining speed. According to the recent data, over 73 million people came online in Africa for the first time in 2017- that’s more than the population of the UK! This means there are now about 435 million people on the continent using the Web to engage, connect and access information online. That’s a good thing! But with this growth comes with an increased need to scale efforts to make the Web more relevant and useful to African users. This will require more skilled hands working with individuals and local businesses to develop content and platforms that will support Africa’s digital growth. In July 2017, Google’s CEO, Sundar Pichai, announced a pledge to provide digital skills training to ten million people in Africa, and also to provide mobile developer training to 100,000 Africans. 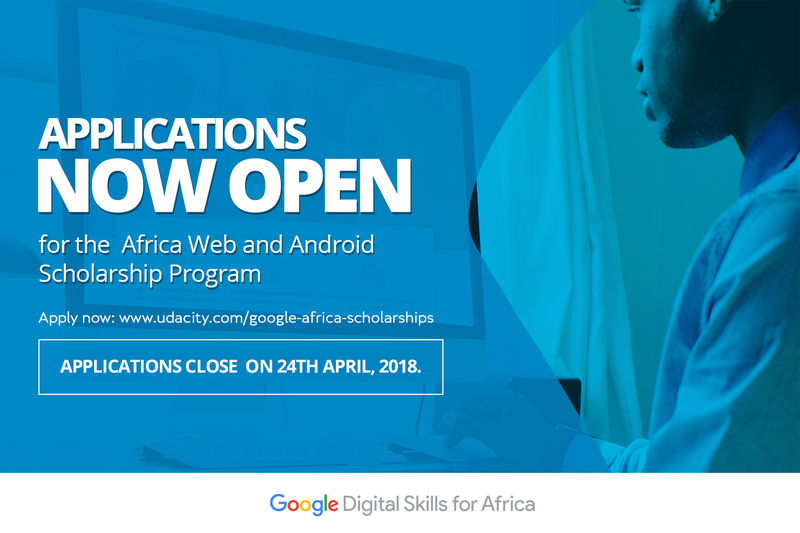 Today, in line with that commitment, we’re excited to announce the launch of our new Africa Web and Android Scholarship program aimed at providing 15,000 scholarships to developers resident in Africa countries. In order to access the full nanodegree scholarships, learners will have to complete lessons and quizzes courses being offered under the Udacity single course scholarships (also known as challenge courses) in addition to their active participation and support of classmates in the student community. We will be offering 10,000 scholarships to beginners (with little or no programming experience) and 5,000 to professional developers (with +1 year of experience) spread across Android and mobile web development tracks. The 10,000 beginner scholarships will include Android beginner courses and basic introduction to HTML & CSS; while the 5,000 intermediate scholarships include Android fundamentals for intermediate and building offline web applications courses respectively. Both courses are taught in English through an online program on Udacity open to Africa residence. The top 500 students at the end of the challenge will earn a full Nanodegree scholarship to one of four Nanodegree programs in Android or web development.